Ever since the early days of all-digital production, some have lamented the loss of that elusive 'analogue warmth'. But how many of us actually know what it is? There's no doubt that tracks produced 30 years ago don't sound like tracks made today. But the same can be said, to varying degrees, of tracks made five, ten, 20 or 50 years ago. Every era has its own sound. So things have changed, but why? Is it the technology? It's our view that digital itself isn't the problem, and that the solution to recapturing the desirably warm, punchy vibe of yesteryear lies in ever more advanced analogue modelling, and simply knowing what you're doing. These nine tips should help you along the path to warm analogue-sounding mixes. Rather than apply a tape emulator to every channel, apply it to different groups of sounds. This mimics the way music used to be successively bounced. You might even consider applying it to different busses, then again to a combined buss further down the line, thus emulating the signal paths of old. Panning mono reverb towards a panned signal makes it feel closer, while panning it away creates a feeling of space and distance. With this simple technique applied carefully to a given sound, you can really place it in the two axes of stereo mixing - left-right and near-far. This works just as well on modern productions as it did on old ones. For a more old school vibe, reserve artificial widening for key elements, allowing the contrast between them and the rest of the track to highlight both. A good example might be putting together a really wide backing track, then adding a completely mono lead vocal with mono reverb (perhaps with a little pan). Or applying wide stereo reverb to just one key synth part. You needn't always throw the book at a track. Sometimes just giving selected parts an old school vibe is more effective than making everything sound dated. If you have a modern track and want to introduce a bit of old-school flavour, try using old-school techniques and plugins on a certain group of sounds. Even if it thins the part out, it might make it stand out far more in the mix. 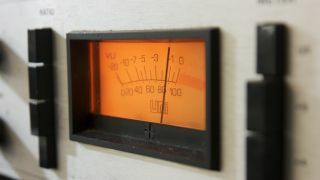 They may not be old-school themselves, but frequency analysers are great for figuring out what a part's key frequencies are, thus helping you apply old-school EQ techniques. Some let you directly compare channels or remove harmonics and display MIDI notes, but even a basic one, as found in eaReckon's CM-EQUA 87, can show you were the main focus of a given channel lies. Work in small increments - particularly with tape emulators and compression - otherwise you'll end up pushing things too far. The temptation is always to go for excessive warmth, as it sounds great on individual signals, but when trying to capture a vintage vibe it's even more important to follow that classic mixing adage: it doesn't matter how it sounds solo - how does it sound in the mix? When recreating mono material, the use of reverb as ambience is even more important. More reverb in relation to a given channel means greater perceived distance - as does higher pre-delay. This mimics the relative distances of real players from a shared mic. Different tape speeds suit different material. A smooth fingered bass might sound warmer at 7.5 or 15IPS, but a picked bass might lose a little of its attack, for example. Also, try varying the speeds within a track to enhance the separation between channels. When using plugins like Waves NLS, always try them in both stereo and dual mono mode, if available. For example, a stereo signal might sound better in dual mono, as the stereo mode uses the same model for both channels, whereas dual mono can introduce separation between them, enhancing the stereo image. You might also lose a bit of punch doing this, however.